Work-life balance is basically the holy grail for working parents. In many ways. I think most of us understand that true balance will never be a reality. Once you have accepted that fact, it’s a whole lot easier to get pretty close to a manageable routine that you control instead of the other way around. After spending years as a homeschooled-student, college-student, corporate cubicle-filler, mom and entrepreneur, I’ve learned that the more I accept imperfect balance, the more balanced I actually feel. Use some of my suggestions for a while and see if you have the same results! Balance is ultimately about feelings. Think about how you talk about your life. I’m so stressed, I’m so busy, I’m so behind, I’m tired, I’m sluggish, I’m weak, I’m exhausted. These are feelings that you feel, not parts of your character. You aren’t those things. You feel those things. This is a really helpful distinction for me because feelings are so notoriously untrustworthy. This is why we have logical minds to point us back to reality and keep our feet on the ground. When stress starts to choke you out, look it in the eye and remind it who it is. Maybe a cheesy mirror pow-wow is just what you need? Try saying this, My stress is not ME. I feel stressed today, but I know it will pass. Another enemy of balance is overthinking, especially for working parents who often have to switch gears at lightning speed. We tend to be planners so we live in the future a little bit. We work hard at our jobs and also our families and we assess our successes and failures to see how we can make next time better. I’m not saying this is entirely wrong, but at some point it has to stop. In case you need reminding (as I often do), we are human beings, not computers running algorithms in the background all day and night. And that’s exactly what overthinking does. It takes us our available mental and emotional resources away from the task at hand and devotes them to other less important processes. To stick with the computer theme, overthinking is like having too many tabs open in Chrome. Nobody wins. For this analogy, I’m going to use shapes. If you really want to get anywhere near balance, you need to know yourself. And by that I mean, know your strengths, your limitations and your peak performance times. Let’s say you have to stack two cubes, a rectangle, and a triangle in your typical day. There is a lot of flexibility here but what we know is by putting the triangle at the bottom, the entire day will be wobbly. Does this ring true? Are you stacking your day by putting the triangle at the bottom? I know that when I get up early, I set myself up for a really productive day. I also know that the days I sleep in, I don’t get the same boost of energy in the first couple hours after getting up. Why is that? Shouldn’t I still be productive in the first few hours of the day no matter when they are? For me, getting up early is like putting the rectangle at the bottom, then follow the cubes and the triangle on top. You can imagine what my day is like when I put the triangle at the bottom. Don’t worry about gurus and experts. Learn what keeps you at your best and it will help you refine your habits into something that works for you. Adequate rest is probably the most powerful tool for learning how to make work-life balance work for you. We all know what it’s like to burn out. We know we need more sleep, more rest, more downtime, yet we just continue the cycle. We’ve heard it a million times but we still don’t listen. It’s time to listen. No one can run on an empty tank. You need to recharge. Daily. Set alarms, take walk breaks, close your eyes. Most of all, get your sleep. Exhaustion is a one-way ticket to freaking out, letting stress control you, overthinking your choices, and thinking you are someone you’re not. Read: Too tired to parent: Is balance a myth? And really, who doesn’t love sleep? Stop feeling guilty about it and add it to your calendar if it helps. Then you can check that box and be one step closer to balance. Finally, I want you to know that balance is a unicorn. No one has it. Probably, no one has ever had it. You are not the only one who wants to make your days a little better, stress less and enjoy your life. And there is not some secret group of people who have made that happen. There’s no secret recipe, no 10-step program, and no magic pill that is going to make our lives perfectly harmonious. All we can do is make the best of what we are given and get out of our own way. It’s when we do this that work-life balance really starts to work. 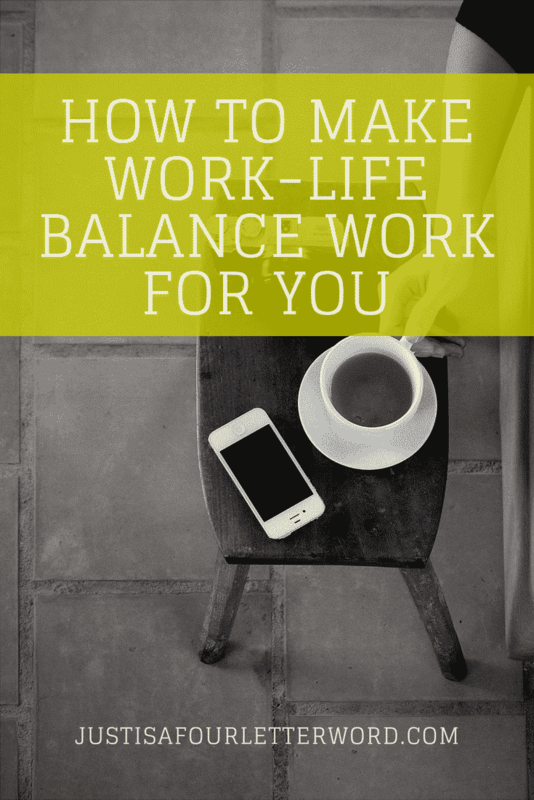 Do you have tips for how to make work-life balance work? Share them below! My biggest downfall is overthinking. I can go into full on over-analyzing mode on almost anything in my life…but I’m working on it! I am right there with you! Do you love learning? I think they are tied together. I love information but I often “overeat” so to speak and then I’m stuck with the thinking. And around we go and try again. I do love learning and about the most random things sometimes too! Yes around and around in the process! Thanks for the great tips. When I started working from home it seems to be harder to balance work and home life. I have to make sure that I set aside time for the family and don’t work during that time. I love that you wrote that we need to take time to change our habits. Yup! All big leaps begin with us. Well written. So positive. Stop over thinking is my biggest takeaway. These are incredible tips. Work like balance is something I need to focus on. These are great tips. I still haven’t figured out a balance yet between homeschooling, work and everything else. Some days are great. Other eh not sh much lol! Rest is so important and often neglected. I know that this adds stress to my life when I do not get enough sleep. And, you are right. Overthinking makes things worse too. These are all great tips! I like the one about not overthinking things. A lot of times it is better to just dive in and get things done when you have the time. Instead of thinking about all you have to do, it can be overwhelming that way. Things seem to work out better for me when I get up early to get things done too. I just am not a morning person so it takes a lot of effort for me to do. I normally feel like I’m a rockstar at balancing things but I’ve been pretty stressed and man, you’re right, that really puts a kink in things. Back to relaxing a little more and maybe everything will start falling back into place.